If he wanted to make a direct statement on the controversy surrounding his position as deputy attorney general, Rod Rosenstein left it for others to insinuate as he offered a general defense of the U.S. rule of law. 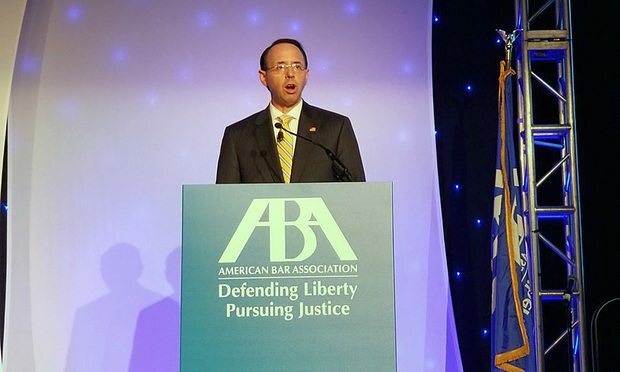 Deputy Attorney General Rod Rosenstein speaks at the ABA conference in Chicago on Aug. 2, 2018. During a highly anticipated public appearance Thursday at the American Bar Association’s annual conference in Chicago, embattled U.S. Deputy Attorney General Rod Rosenstein avoided speaking directly about his controversial role overseeing an investigation into Russian interference in the 2016 presidential election. When clients use finance companies or crowdsourcing platforms to pay legal fees, lawyers have stricter ethics obligations if they're closely involved with the fundraising efforts, bar associations say. Lawyers got a lot of press in 2018, and some of it stemmed from allegations of serious misconduct.